NEW On-Line Giving Coming Soon! Thank you for using Saint Pius X online giving through ParishPay as a way to join with the vision of our community to connect people to Jesus Christ through faith, love, ministry & generosity. Financial giving is divided into two categories: tithes & offerings. Tithing is form of Stewardship that supports the regular operations of the parish: programming, building maintenance, activities, etc. When we feel called to give over and above our tithe, it is considered an offering. Giving/Tithing through ParishPay can be done so on a one time or reoccurring basis. It makes it easy to fulfill stewardship commitments, even when you are unable to attend Church. You never have to bring cash or checks to Church. Giving electronically also helps the Church save money and plan its budget! Once you complete the online registration form, the contribution amount you specify will automatically be transferred from your bank account or credit card to the Church’s bank account. Your electronic contribution will be debited on the date you specify on the “My Gifts” page of the Online Giving system. You can set up to contribute to different offerings at different times; however, you will have to do each one separately. You will receive a receipt for each one. Log in and update your account information in the My Payment Schedule window. Each checking/savings/credit card can be changed using the edit button, deleted completely, or new accounts can be added on the right side of the screen. You can cancel your authorization by deleting your accounts and donation dates at any time. Click Here to enter the online sign-up, then click “Watch Help Video” for a step-by-step guide. New to Saint Pius X ? 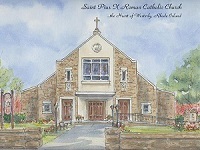 Saint Pius X Catholic Church is right in the heart of Westerly, RI located on beautiful Elm Street and serves the community of Westerly as disciples of our Lord and Savior, Jesus Christ.